Last year there were 17,920 “spectacles or popular celebrations, in which they play or run cattle according to the traditional uses of the locality”, in the Ministry of Culture’s ever elegant phrasing. 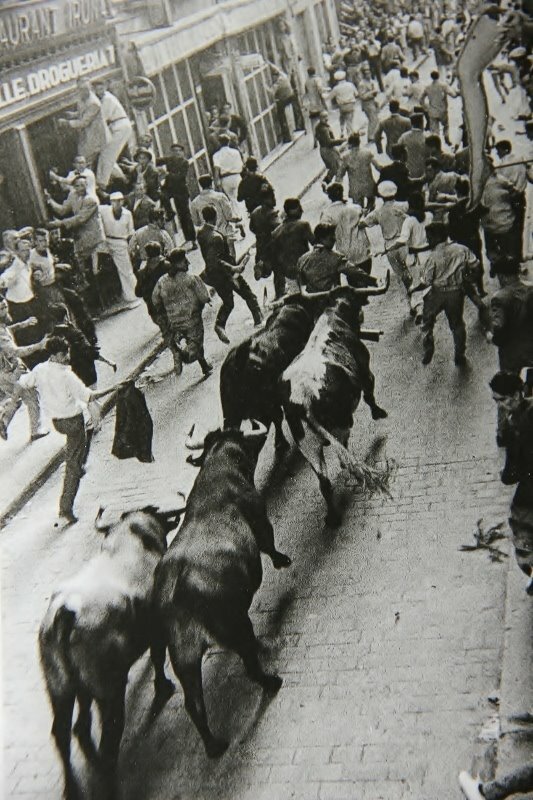 These ranged from the grand encierros – which count as 8 events in this type of census – of Pamplona in honour of San Fermín, to the little sueltas – release of three year old vacas, one at a time one, down the high street into a fenced circle where the local young braves practice their cortes and recortes – in the village of Funes, population 2,000, in honour of San Isidro. These numbers are extraordinary, with El Pais estimating in an article last year that 1 in 4 of Spain’s towns and cities hold an event with a res brava, an example of ‘fierce cattle’, of some description. While it is easy to see the empirical evidence, what is far harder to understand is why. What change has occurred among the peoples of the Spanish Kingdom that getting up close and personal with a wild horned thing, or watching some other amateur do it, has become so much more popular while paying to watch trained professionals do something far more interesting with the largest and most fierce examplars of the breed has become less so? Is it the fact that these events are mainly bloodless? 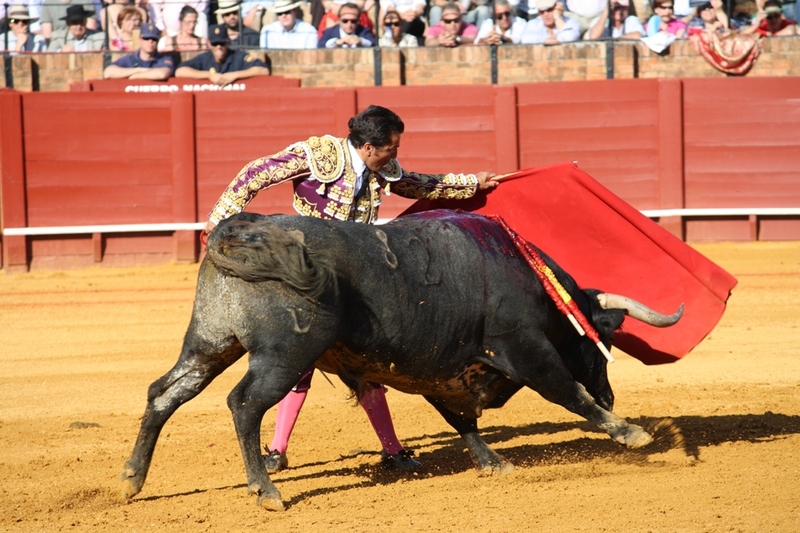 Has the modern mind turned away from injury and death in front of an audience – whatever else the corrida contains, it undeniably contains that – so much so that it can no longer bear to witness it? Well, in a way yes, but the real answer is subtler and more profound than this. Each person in the Western world is responsible for dealing out far more suffering – in the form of fear in the slaughterhouse – and death through their consumption of meat than any of their far cruder and coarser ancestors. They just don’t want to see it happen. However, there is also a social and generational shift going on which in some ways is eternal, but in others is a child of the 1960s. A decade that marked the rest of Europe and the US, but took Spain a while to catch up to and which is a rebellion of youth against the deference-requiring triumvirate of tradition, ritual and status. And what could embody that these than the world of matador, their cuadrillas – teams – and their bulls: a world of of gold, silver and leather. It was Orson Welles who first saw it when describing El Cordobés to Kenneth Tynan as the ‘Beatnik bullfighter’, and that has happened with various toreros since. The present example of this is José Tomás’s rebellions on all fronts – not only against the normal canons of a taurine career (see Michael Wigram’s excellent and surprisingly balanced essay Tirar Del Caro, ‘Pulling The Cart’, to feel his anger on this), but also bowing to either king, God, or even the people’s modern religion, television. His combination of these defiances with his extraordinarily moving toreo, and an utter contempt for risk, mean that he makes other matadors look like mere journeymen and their choices like a form of complicity with the something old school, aka The Establishment. This heady cocktail of greater ability with his own sense of his superiority to this highly structured institution runs the risk of not only not saving the modern bullfight, as many short-sighted commentators thought, but overseeing and even hastening its demise – he comes, without Mark Antony’s sarcasm, not to praise Caesar but to bury him. And where better to start than Cuéllar, the oldest of them all – suitably set in Old Castile – whose Feria of Nuestra Señora del Rosario begins on the last Saturday of every August. Now, there is a long-standing tradition that Cuéllar’s encierro existed before the letter from Pope Innocent III, dated 1215 A.D., banning priests from running. However, this was unlikely to be an encierro as we know them today, and the particular phrasing actually refers to something more like a capea, an informal bullfight, than an encierro. That said, they do definitely predate those of Pamplona and may well have led to them, since the Dukes of Alberquerque – 3rd to 5th – whose castle and court were in Cuéllar, were made Viceroys of Navarre in the mid-16th century, and the first records of encierros in Pamplona were at the end of the 16th, which would indicate at least circumstantially that the Duke or his men brought the tradition with them. It is a rare enough thing that the bulls all enter the town – guided by the 300 horses, this run includes an encierro del campo – at the embudo as a herd, and even rarer that they make it round the various corners and slopes that comprise the encierro de la calle as one. 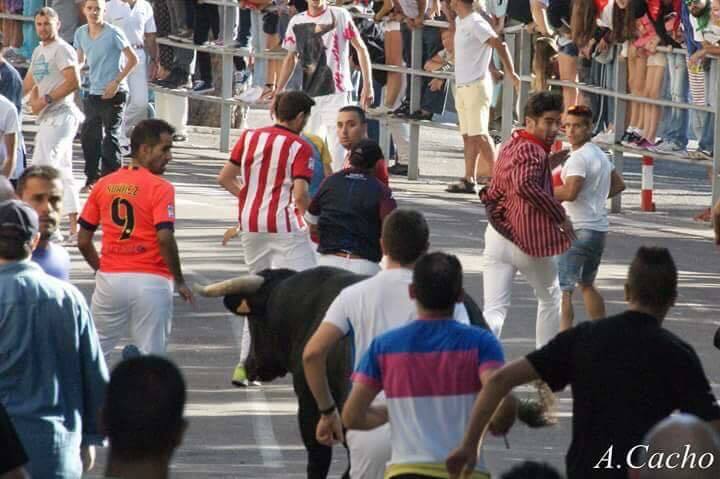 On the Avenida Toros, the straight leading to the plaza, it is not at all rare to find oneself running one suelto up the street only to find another coming back in the opposite direction. It is not hard to see why the bulls so often come out of this broken down (if not outright lost, as has happened more than once.) However, when they get it right, it can produce serviceable bulls in the ring. 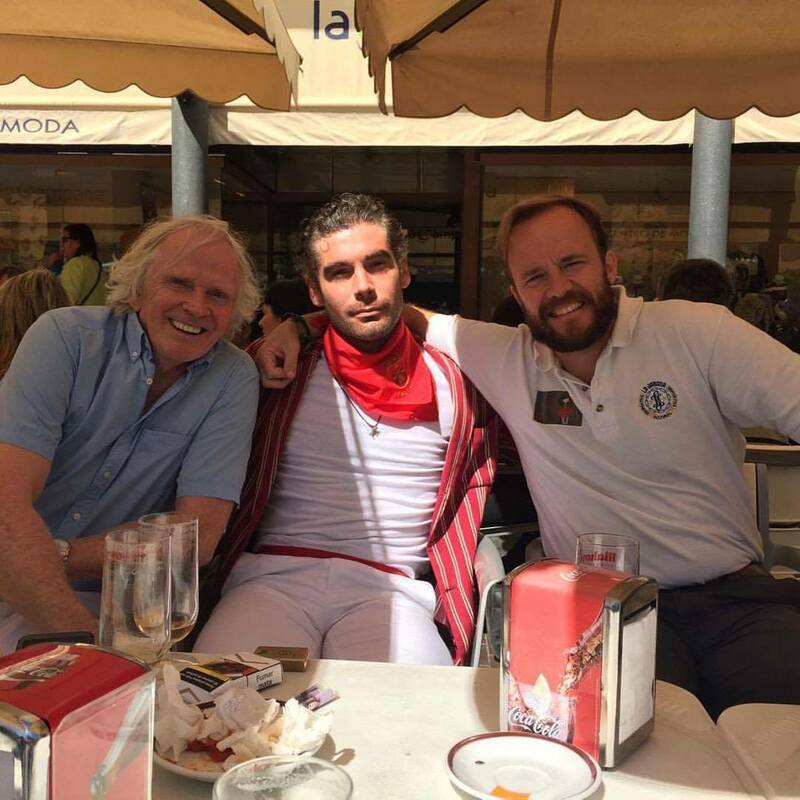 In 2016 I sat with Jim Hollander in that plaza and saw his – and note not only are Jim’s 50 sanfermines being celebrated in Pamplona this year, but that he grew up in Spain – first indulto, ‘pardoned’ bull. 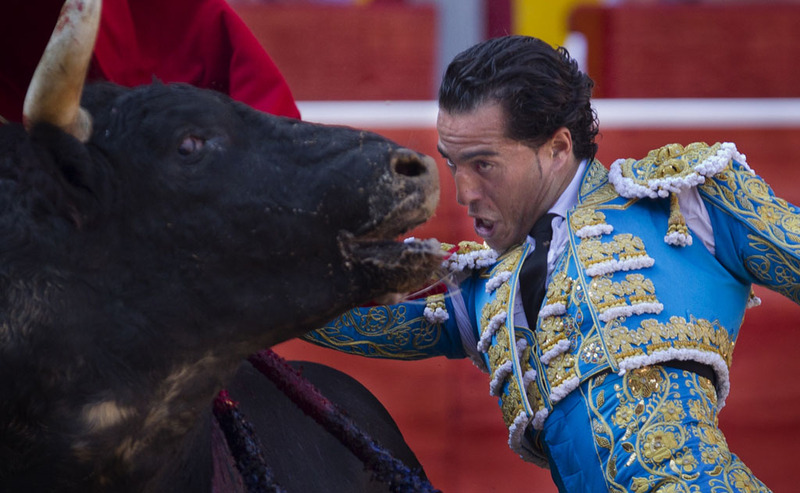 There is no denying the matador responsible, David Mora, performed excellently – as did Curro Diáz – but also the bulls were good. 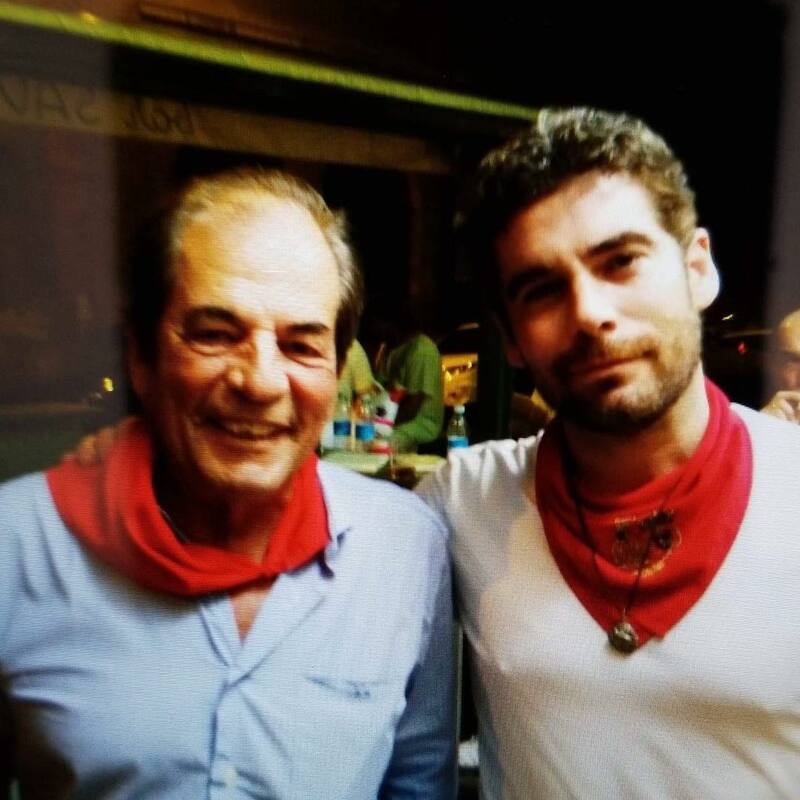 So good in fact, the head of the House of Domecq – in seniority if not profit margins – the former rejoneador Álvaro came and said hello. 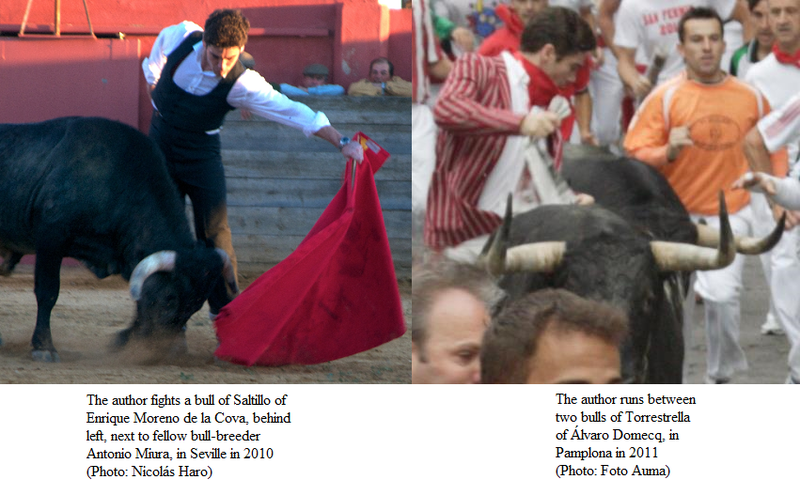 It turns out that the bulls were descended from his own ganadería of Torrestrella, a favourite of Pamplona. Such bulls took the encierro well within their stride, did not separate and thus could not be lured to exhaust themselves on the barriers, and so came back in to the ring that evening with sufficient spirit to dance and die well, albeit with fewer tandas, ‘series’, of passes than you would find in their home town of Jerez de la Frontera. 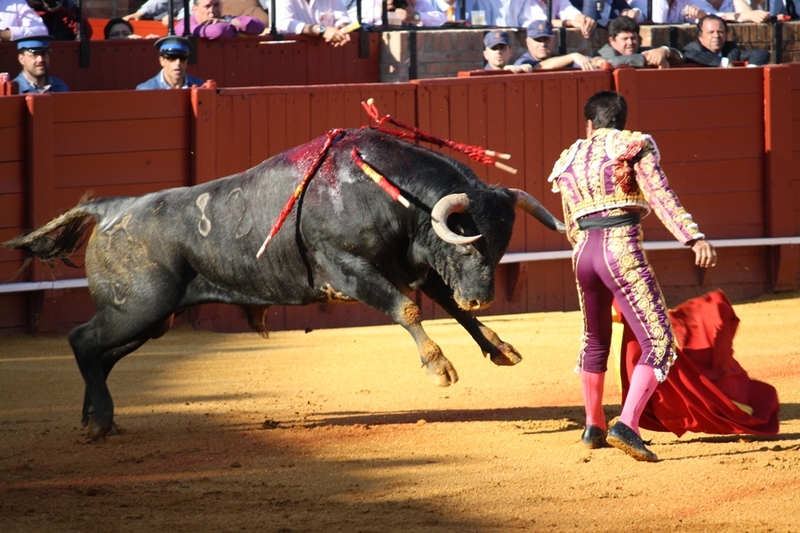 The finest corridas to be found after encierros are – from the point of view of bullfighting – in San Sebastián de los Reyes, ‘Sanse’, whose Feria de Cristo de los Remedios often partially overlaps with Cuéllar. 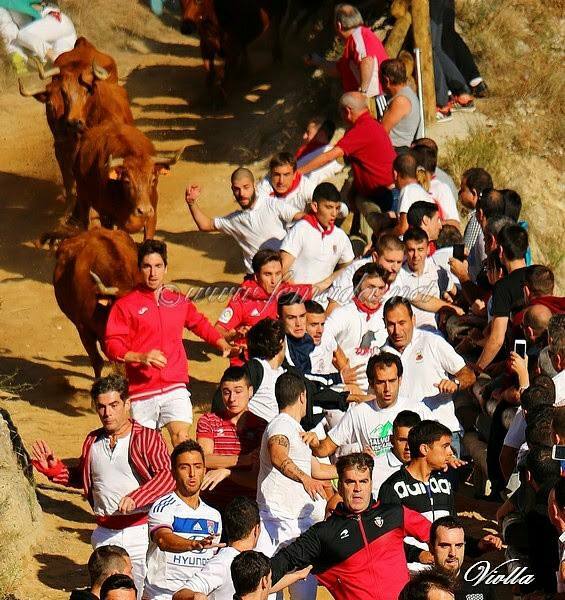 Sanse is a good fast encierro around the 800 yard mark, which, although crowded by other encierro’s standards, never reaches the crowds of Pamplona, and has two other great advantages: almost everyone knows how to run, and the bulls are not required to be Pamplona size. These two facts tend produce uninjured bulls of manageable size and charge for toreros like José Maria Manzanares to turn at command and die on request with something approaching the artistic merit and beauty of the Andalusian rings. However, what it does have right next door is a second encierro which must have the highest ratio of spectators to runners I have ever witnessed. 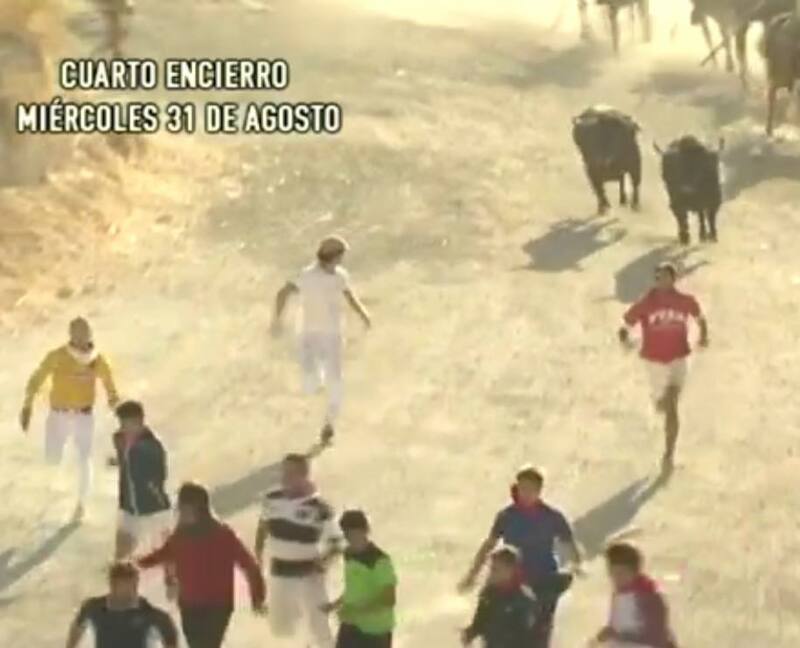 Falces is famous for having the “run of runs”, El Pilón, a mountain goat-path down which they stampede up to a dozen full grown vacas of the now relict Navarran encaste with their long twisting horns – including those of famed Pamplona pastor Miguel Reta – accompanied by a few dozen hardy runners. This is a run which no one in the car in which I first travelled to it – at speed, directly following the encierro in Tafalla – was willing to run, neither were any of the noted runners whose hands I shook on my way up the goat-path. The very top is where a group of older runners – a dozen maybe – who have the marks of generations in this place written upon them run the flat, escaping up-slope. There are many other runs: I could personally speak of Estella, the encierro I ran whilst not officially even being there (a story for another time), or Medina del Campo, which also has a horseback cross-country element, and is shaped like a horseshoe so you can cut across and run twice, where I ran with the great taurine journalist, Chapu Apalaoza, the voice of the Fundacíon Toro de Lidia, ‘Fighting Bull Foundation’, with whom I am currently working in an attempt to roll back the tide of anti-taurine propaganda which one day will not just take the corridas from us, but the encierros and eventually the toros themselves as well. 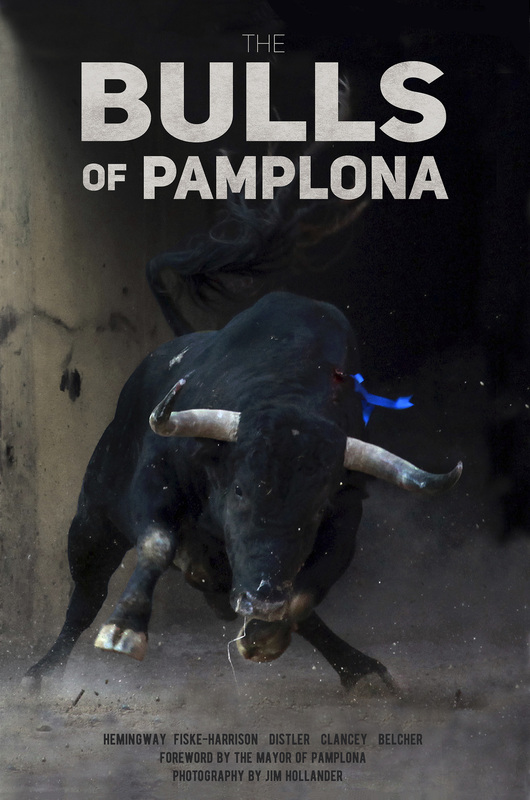 Soon, I hope, I will be able to invite people to join Foundation as a friend or members in support of the bulls, but in the meantime, I can only point you to buy a copy of The Bulls Of Pamplona the book I co-wrote and edited. 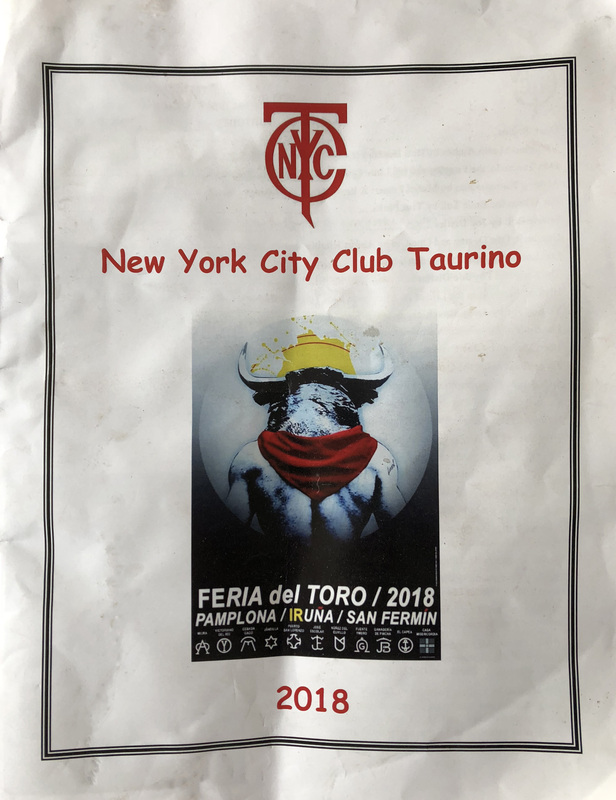 My co-authors include the Mayor of Pamplona, John Hemingway, grandson of Ernest, Beatrice Welles, daughter of Orson – great aficionados of both the bulls and the city – along with the great American runner Joe Distler who has run there since 1968, the Texan rodeo champion Larry Belcher who also ran there for forty years, a tactical and strategic breakdown of the run today by Captain Dennis Clancey of the 101st Airborne Division, as well as tips and pointers by the great Basque and Spanish runners like Julen Madina, Miguel Ángel Eguiluz and Jokin Zuasti, and photos by the European Pressphoto Agency – and before that Reuters – senior photographer Jim Hollander, who when not embedded in half the wars around the world ran the bulls in the ’60s and ’70s until he was put in hospital by two Miura bulls in 1977 and returned to photograph every Fiesta since. 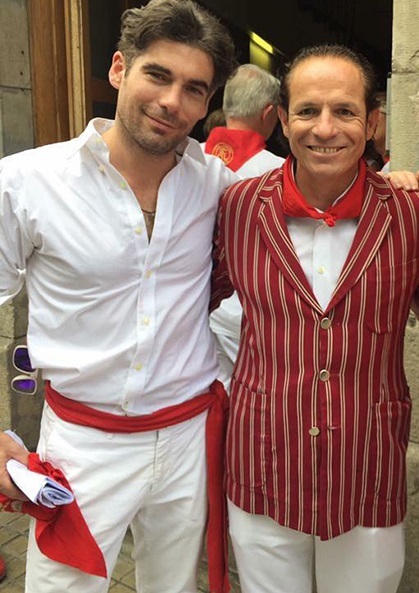 Below is a link to our Editor’s translation of Chapu Apaolaza’s excellent open letter to the (current) Mayor of Pamplona about bullfighting. 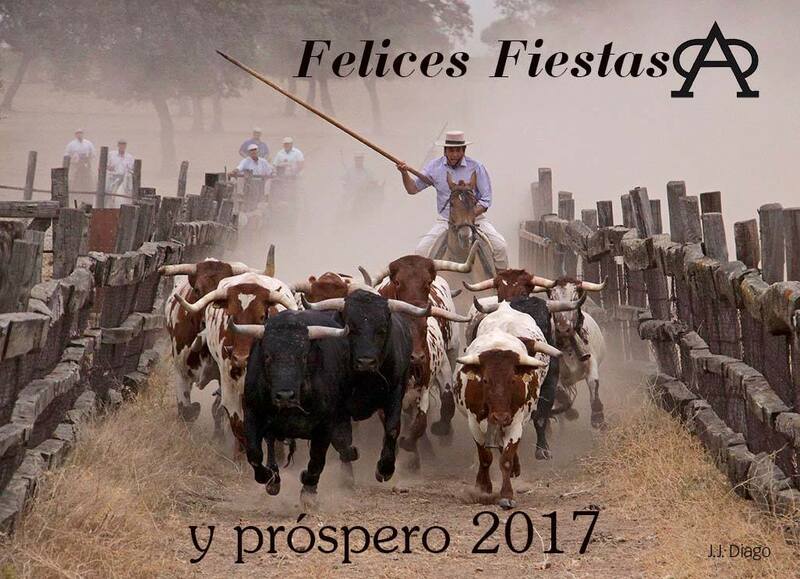 This is written in Chapu’s guise as spokesman for the Fundación del Toro de Lidia, ‘Foundation of the Fighting Bull’, with whom he has also been working. He add that in Chapu’s guise as author, he will be signing copies of his seminal book on Pamplona, 7 del Julio, in a new translation by Larry Belcher, who will also be reading from it – as will the Editor and Joe Distler and others – at the iconic Pamplona Café Iruña at midday on July 9th. 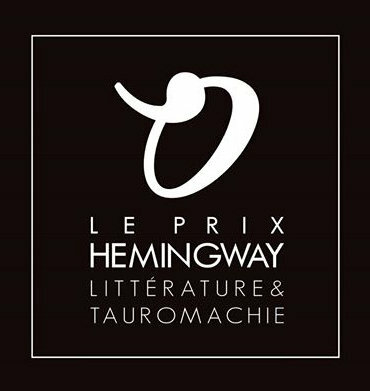 Our Editor’s short story ‘The Unbroken’ was a finalist of Le Prix Hemingway 2016, run by the French publishers Au Diable Vauvert, the first English finalist since the prize was founded. Of 260 entries in this, the prize’s 12th year, 30 were chosen as finalists and, of them, the 16 best were chosen for publication in this year’s anthology, which is out today. Obviously, all the stories have been translated into French, ‘The Unbroken’ as ‘Les Invincibles’, so for those who are not fluent in the language of Molière and Descartes, Maupassant and Dumas, here it is in the language of Milton and Dickens, Maugham and Dryden. Robert Gough’s head jerked up at that. He’d been wrapped around a glass of whisky trying to look as inconspicuous as he could. He saw his mistake: the bartender wasn’t referring to him but was nodding towards a dark-haired young man carrying a stack of newspapers. Robert hunched back over the polished oak of the bar. While his eyes studied the etchings on his glass, he noted the young Englishman’s accent: the clean diction of a private education which seemed out of place for a newspaper hawker. Robert had developed the introvert’s habit of listening to people rather than looking at them. Although today he had other reasons to hide. He pushed his drink with the painful fingers of his left hand into the unfeeling clasp of his right, lifted the glass to his lips and let the liquid burn down into him, scalding away one more sliver of the pain. This voice, booming down from the other end of the bar, was a completely different beast: loud, West Coast American, but most of all it pitched and rolled from syllable to syllable like a theatre actor trying to be heard over a storm at sea. “Forty francs,” said the seller. The man’s voice was absurd, Robert thought to himself, although he envied it its vigour. He just hoped it wouldn’t draw too much attention. 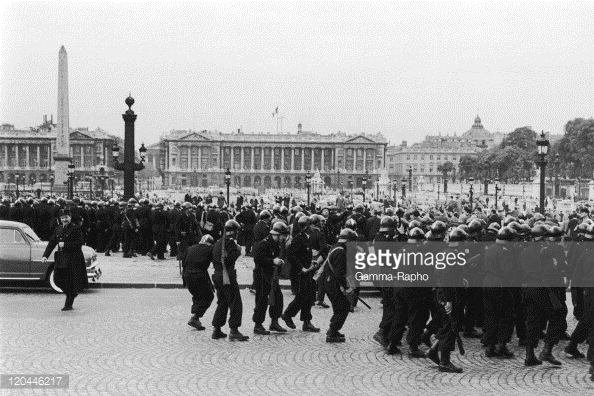 The police had been very determined in their pursuit, following him over the river and into the Latin Quarter until he’d lost them among the twists and turns of the narrow streets. He could still run at least. “Matt here doesn’t believe the police raided the ’Trib’s offices yesterday,” another voice said. This other voice was also American but quieter and slightly thicker, a New Yorker with an adenoidal touch. As the newspaper seller moved past him, Robert gestured him over. The young man put out his hand in greeting and Robert regretted beginning the conversation. He lifted his useless, right hand and showed it to the young man. The digits were half curled and rigid within a glove: it looked like a leathered claw. The young man couldn’t hide his slight recoil at the sight, like a healthy animal from sickness. Robert had to turn away from that. The young man, embarrassed, walked out of the café without trying to sell any more. 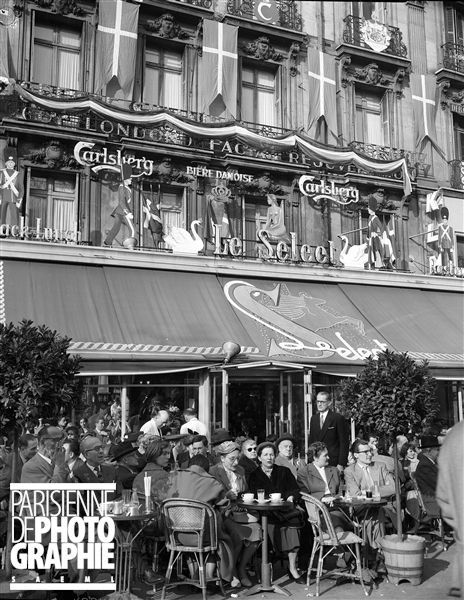 Robert sat looking at his drink again: the bright lights of the café seemed a little less bright now, the grey sky out beyond the windows a little closer. The Californian was talking loudly again, the voice pitched to be heard, although the words were directed at the New Yorker. Robert glanced in the mirror and saw the eyes of the man waiting for him there. They were blue, set in symmetrical features, with sandy hair on top like a matinee idol, but the eyes were hard. “Leave it Matt,” said the New Yorker. Robert looked across the bar at that. In the lights reflected on the shining bar the man’s eyes glittered and Robert could see he was drunk. The New Yorker wasn’t as drunk, but he wasn’t in command here. The Californian began to move down the bar sideways towards him, one arm sliding along for balance, but the feet still had a fighter’s gait. Robert had almost finished his fourth whisky on an empty stomach and his good hand still throbbed through the haze. Despite pride and instincts welling up inside him, Robert knew he wouldn’t last a moment, nor did he want the police attention it would bring. Saying that he peeled off his glove, showing the withered hand like the foot of a dead bird, thin in all the wrong places, the wrist just skin over bone. Robert expected the usual response to that – the combination of pity and revulsion – and so the man’s laughter took him by surprise. It rolled around from hard the tiles of the floor to the dusty mouldings on the ceiling. Robert nodded. This made it easier, at least, less shaming. “Sorry son,” Art said. He said it with pity but it was of the right sort. The bartender took down a bottle from the glittering array. Matt put out his left hand to shake his Robert’s and without rancour Robert raised his other hand for inspection. The swelling was so bad now it was clear something was broken. He said the last in a voice that was meant to be a joke, but the truth of it stuck in the tone and the two men smiled and nodded. “Toros?” Robert was enjoying playing along now. He knew he had, as so rarely happened recently, fallen into good company. And then the stories began. Robert quickly regretted not following up on their invitation. There followed a hard winter for Robert. Things had happened and he’d been forced to return to England. However, he’d still made the train from Paris to Toulouse on July 1st. His money had run out there, but he’d hitched and walked, climbed and hiked, until he was over the Pyrenees and fell in with some pilgrims on the Way of St. James. It was dawn on the 12th of July when he reached Pamplona, and, once inside the old city walls, it had the chaotic feel of a city recently sacked. Debris littered the ground as on a battlefield, although the gutters ran red with wine rather anything more opaque. Among the dregs of the bacchanal, jarringly pristine marching bands blasted alien tunes into the air from gleaming brass. Robert asked the first sober person he could find – an elderly woman sitting in a doorway – a single word question. She looked him up and down, laughed and pointed down a wide street; he half expected her to begin knitting black wool. He reached a set of thick wooden barriers, constructed as though to constrain elephants rather than cattle, and he knew that he had come to the right place. He climbed through into what was obviously the town square, with a strikingly Baroque town hall, topped by a clock chiming a quarter to seven. He asked again after the bulls and a man point him down a street to the side of the building. Robert walked down the slope. He’d taken Buchwald’s advice and dressed accordingly, from his white canvas plimsoles up, topped with a scarlet neckerchief. However, he also had his old Army rucksack which he needed to stow somewhere in the next fifteen minutes before the bulls came. He was wondering about that when a voice boomed out that brought his heart into this throat. He turned to see a tall blond man standing foursquare on the other side of the barriers in an alleyway. He was surrounded by several men of non-Spanish mien and in various states of sleeplessness and alcoholic disrepair. Robert approached. He felt himself folded into a bear hug and then the conversation continued. Robert shook the left hands of the men who even through their disarray had a distinct air of purpose about them. “You running?” Matt asked him. “There are five steers, but they’re just the transport. Big and white, brown and bony, their horns are blunt and their minds are innocent of anger. The bulls, on the other hands, are low and beautiful and sleek and weigh about twelve hundred pounds but can shift direction as quick as a leopard and when they’re on their own they’re like a shark when there’s blood in the water. Matt looked Robert up and down at that. Robert stood and lean and tanned from a fortnight of walking and hiking in the mountain sun. With that they climbed into the street and walked down to where a group of men were standing around a figurine in a niche cut high into the wall. The men gathered began a ritual chant in which the only words he could make out were ‘San Fermín’. Once they were done, Matt and Robert walked back up the street and as they did so, various people came up to him and shook his hand, saying a word which Robert couldn’t make out. Robert looked around and saw there were more people than he’d thought – some in whites, some in suits as though going to church – all the faces were pale and serious though. Some were praying. Robert realised his own fear was growing, and discovered how much he had missed that feeling. An old enemy was back but now it was dressed as an old friend. He began smiling and saw it echoed on Matt’s face, who bounced an elbow off his ribs. They jogged out of the square along another stretch of street. Everyone seemed to be fixing themselves now: some taking a stand, some like them running slow, others fast. Matt pointed to some of the last group. Then what sounded like a gunshot exploded in the air and Robert flinched at the sound. As he rounded the corner, Robert saw what he could only view as a killing field. It was a third of a mile of street straight, with a slight incline, and absolutely no exits. They were going faster now and Robert began to worry. What was he doing? Did he really survive a World War to die with a herd of Spanish cattle because of some crazy Americans? He looked at Matt who was, if anything, smiling even more than before. Robert wondered if the man was actually insane. He started to run faster, trying to get to get to the fences in the distance. Seconds later he heard a voice shouting up the street behind him. Robert looked over his shoulder at a sight that would haunt his dreams: there were the fighting bulls, horns like blades of bone, bodies squat in their muscular bulk although rising head-high with the bounce of their gait. And running in the middle of the street with a few other men who seemed to possess the same confidence was Matt, still smiling. 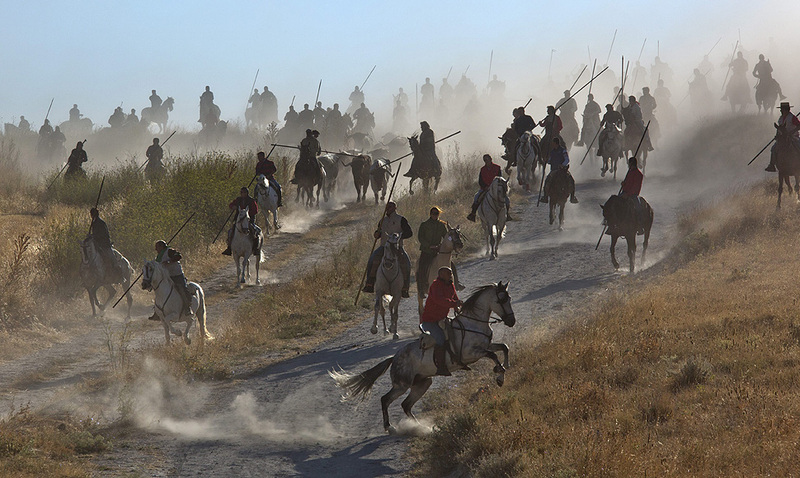 Other runners were leaping out of the way, pinning themselves to the walls, throwing themselves on the floor, clawing over one another in a panic to get out of the way of Nature’s own great cavalry charge, fleeing the stampede. Robert saw the fences. “Run!” Matt shouted, his words like those of a dying man in Robert’s imagination. Robert knew not to look back, that it would only slow him down, and reckoned he only had twenty yards to the fences, if he could only get there. He dug into his reserves only to see a great dark shape draw up beside him. The gloss-black sphere of the bull’s eye, alien and alone, studied him as it blocked him from the exit route. He looked to his left and there were two steers, careening down the street helter-skelter, great hooves clacking on the cobbles and bells ringing round their necks like doom. They hemmed him in, cutting off all possibility of escape. Robert chanced a look behind and saw two more bulls coming up directly behind him, the points of their horns aimed steady as rifles at the square of his back. He now lacked the breath to outrun the animals, and to drop back into that forest of swaying horns and pounding hooves was unthinkable. Between the last two animals, running at a flying sprint and laughing like a demon was Matt Carney. At that Robert realised the madman was right. The animals alongside him were not trying to hem him in, nor those behind to use their horns. They were in fact gathering around him, almost as though to protect him, and they were certainly clearing the street in front of him. His feet warned him of the downward gradient of the street as a great structure of concrete and stone loomed in front of him: he had arrived at the bull-ring. He focused on his footing and kept with the bulls as the last of his stamina flowed out of him into the cobbles. He entered a narrow tunnel and felt a hand on his shoulder as the great beasts glided past him, before the hand gripped his shirt and jerked him to the side. “There’s one more behind and he’s not happy. We’re out Lieutenant,” said Matt. 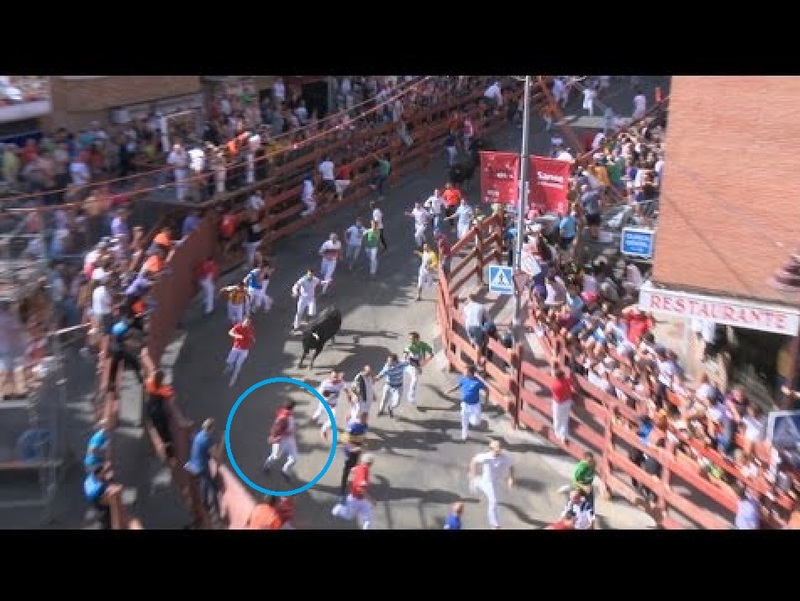 They both ran over to the wooden barrier as a last bull entered with a runner in front and Robert could see the difference. It wasn’t running with the man, but after him, and it caught him, throwing him fifteen feet through the air with a careless shrug of its swollen shoulder muscles. 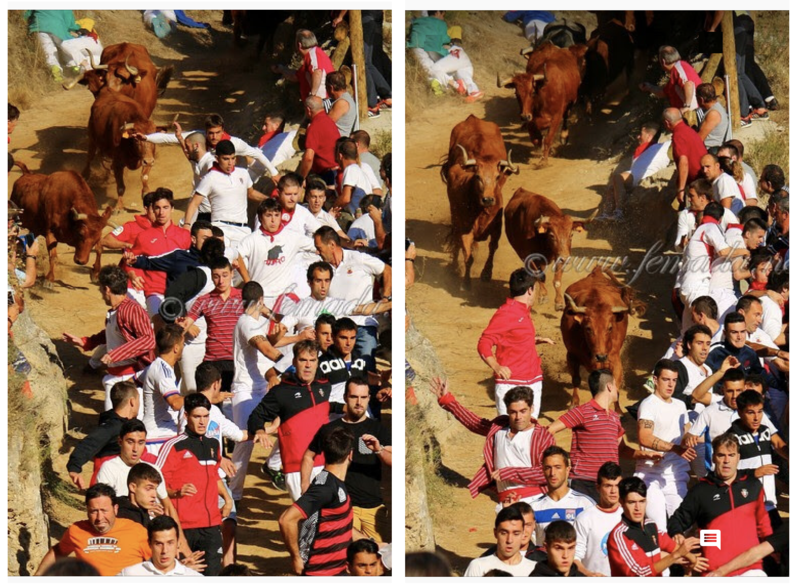 The bull then turned and appeared to catch sight of Robert who had just reached the barrier. However, with only one arm, and legs as weak as a fresh foal’s, he could couldn’t climb over. The animal’s own massive leg muscles bunched and exploded so it seemed almost to leap out of itself as it charged directly at him. Robert knew there was nothing he could do. The barked command kick-started old drill-reflexes, stiffening his slack muscles and allowing a pair of arms to grab his shoulders and literally pivot him head first over the planks. At the same time a lone man run out in front of the bull, with nothing but his red neckerchief in his hand, and caught its attention, drawing its charge away. “Now that, laddie-boy, is the cape of Saint Fermin interceding with the Devil on your behalf!” said the madman who had pulled him out and was now standing over him. Matt was still laughing as he helped Robert to his feet. Robert, unable to stop himself, and despite the fact that he was still panting from adrenaline and exertion, he began to laugh in response. It was over, and it had been beautiful, with none of the mixed feelings – the tainted moralities or tragic consequences – of war. He had not felt this good, and this much himself, in years. 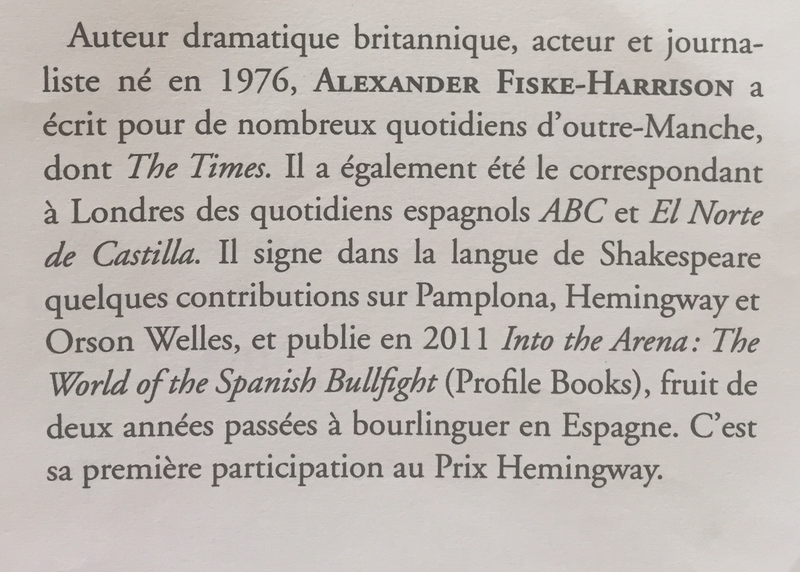 British playwright, actor and journalist born in 1976, Alexander Fiske-Harrison, has written for a number of newspapers across the Channel like The Times. 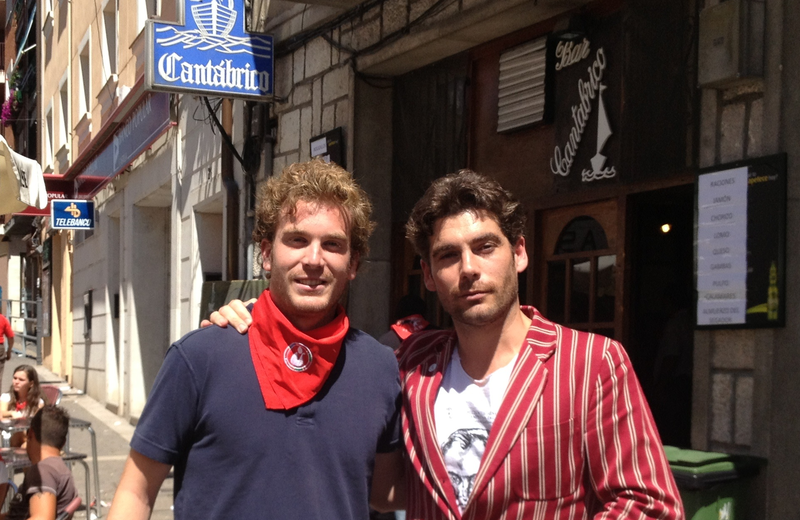 He has also corresponded from London for Spanish newspapers like ABC and El Norte de Castilla. 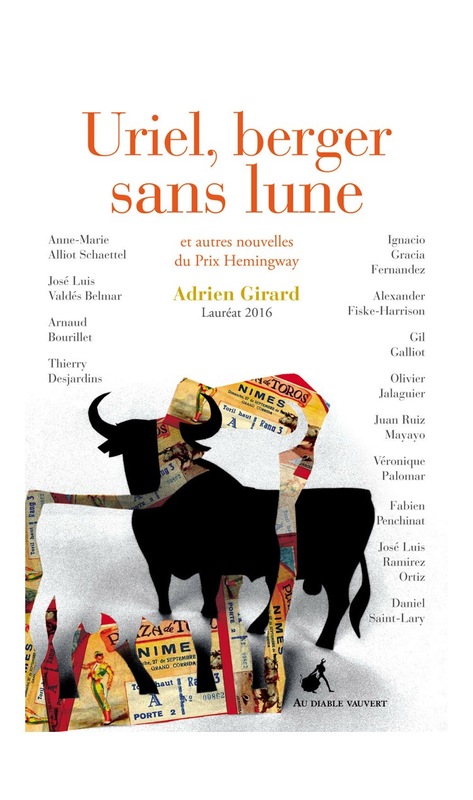 He has authored in the language of Shakespeare several contributions on Pamplona, Hemingway and Orson Welles, and in 2011 published Into The Arena: The World of the Spanish Bullfight (Profile Books), the product of two years bullfighting in Spain. This is his first participation in the Hemingway Prize. 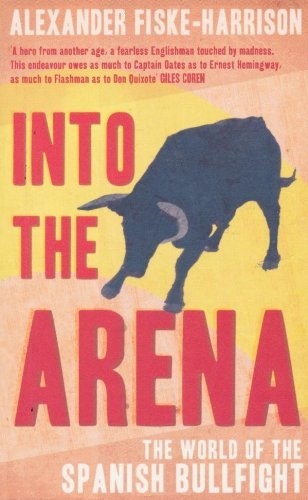 His essay on bullfighting can be found at the blog ‘The Last Arena’ online here. His personal blog is online here. All characters who appear with the exception of Robert Gough are real. 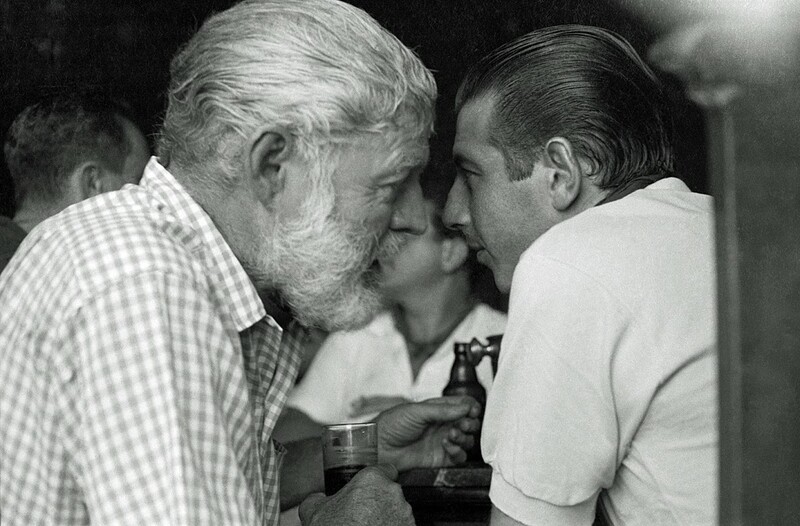 Matt Carney’s encounter with Ernest Hemingway later that day is recounted in his book Peripheral American and also in James Michener’s Iberia, but not in Hemingway’s The Dangerous Summer. With thanks to Matt Carney’s children, Allen and Deirdre, and Joe Distler, to Ernest Hemingway’s grandson John, to my father Clive Fiske Harrison who did indeed sell the Herald Tribune on the Left Bank in ’58, and to Antonio and the staff of Le Select. In memory of my dear friend Noel Chandler with whom I first visited Le Select as an adult – along with Larry Belcher and Ana Cerón – of David Pierce who appears in the story – and Art Buchwald’s article – who died while it was being written, of Julen Madina who died this month and all the other runners of the encierros of bulls, my brothers-in-arms.